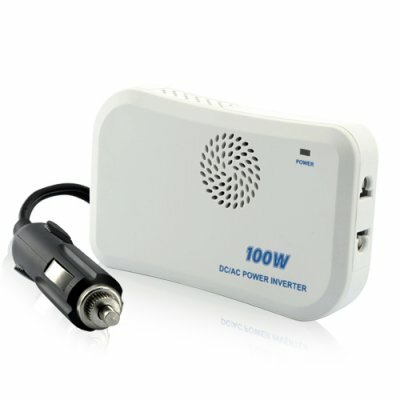 Successfully Added 100W Power Inverter (12V DC to 220V AC + 5V USB Port) to your Shopping Cart. This simple and effective 100W Power Inverter, with its tiny, portable size and white plastic shell, brings you convenience and reliability by converting 12V DC power to 220V AC power. Just plug it into your car cigarette lighter outlet and you are ready to go. With this great Inverter, you can finally use your laptop in the car without worrying about running out of battery juice. You can also use the USB port to charge your cell phone or a variety of other portable electronic devices on the go. The 12V DC to 220V AC Power Inverter with 5V USB output features low vehicle battery auto shutdown, and prevents overload or short circuit. The built-in fan keeps it cool and safe even if you use it for hours on the road. Just sit back and enjoy your in car entertainment with complete peace of mind. The awesome Power Inverter is now available in our warehouse for both single and bulk order purchases. It is also backed up by our famous 12 month warranty. Add it to your cart now and we will express ship it to you tomorrow! All this is brought to you by your reliable source of China wholesale electronics, Chinavasion. - Type C plug: throughout continental Europe (Austria, Belgium, Bosnia and Herzegovina, Bulgaria, India, Czech Republic, Croatia, Denmark, Estonia, Finland, France, Germany, Greece, Greenland, Hungary, Iceland, Italy, Latvia, Lithuania, Luxembourg, Macedonia, the Netherlands, Norway, Poland, Portugal, Romania, Serbia, Slovakia, Slovenia, Spain, Sweden, Switzerland, Turkey). It is also used in the Middle East (Iran), most African nations, South America (Brazil, Chile, Argentina, Uruguay, Peru and Bolivia), Asia (Bangladesh, Sri Lanka, Indonesia, Pakistan and the Philippines) as well as Russia and the former Soviet republics, such as Ukraine, Armenia and Georgia. - Type E: France, Belgium, Poland, Czech Republic and Slovakia. - Type F: Austria, Bulgaria, Chile, Croatia, Estonia, Finland, Germany, Greece, Hungary, Iceland, Indonesia, Italy, Latvia, Luxembourg, the Netherlands, Norway, Pakistan, Portugal, Romania, Russia, Serbia, Slovenia, South Korea, Spain, Sweden, Turkey, Ukraine and Uruguay. - Type G: the United Kingdom, but also Pakistan, Ireland, Sri Lanka, Maldives, Bahrain, UAE, Qatar, Yemen, Oman, Jordan, Cyprus, Malta, Gibraltar, Botswana, Ghana, Hong Kong, Macau, Brunei, Malaysia, Singapore, Indonesia, Bangladesh, Kenya, Uganda, Malawi, Nigeria, Mauritius, Iraq, Kuwait, Tanzania, Zambia and Zimbabwe. BS 1363 is also standard in several of the former British Caribbean colonies such as Belize, Dominica, St. Lucia, Saint Vincent and the Grenadines and Grenada. - Type I: Australia, New Zealand, Fiji, Argentina, Solomon Islands, Papua New Guinea, Mainland China, Argentina and Uruguay.